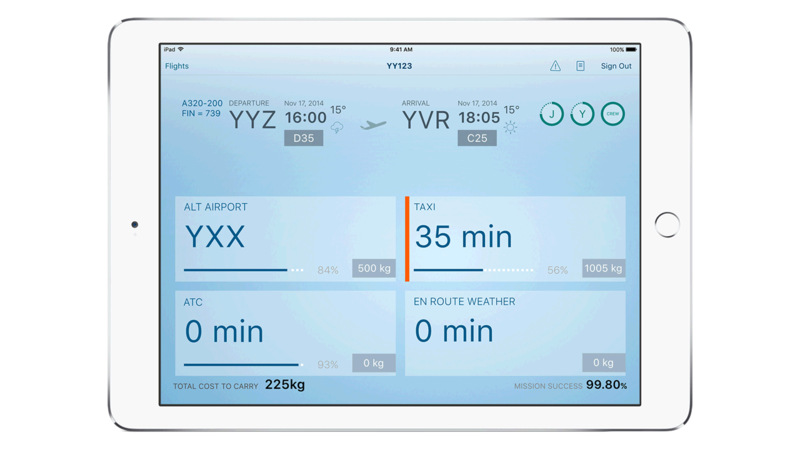 IBM MobileFirst for iOS Plan Flight provides real-time analytics so pilots can make informed decisions about costly discretionary fuel and eliminate guesswork. IBM MobileFirst for iOS Plan Flight addresses the major expense of all airlines: fuel. It puts real-time analytics into the pilot’s hands to make more informed decisions about discretionary fuel. The app permits pilots to view flight schedules, flight plans and crew manifests ahead of time. Pilots can also report issues in flight to ground crews. Pilots are responsible for determining discretionary fuel loads. Although fuel represents 30 to 40 percent of operating expenses, decisions about the reserves are made largely by a pilot’s gut. Plan Flight eliminates the guesswork – replacing it with fact-based decision making. Pilots are able to take the guesswork out of fuel needs by analyzing current conditions, historical data, expected taxi times, weather patterns and in-air holding patterns. The app provides pilots with various fueling scenarios in seconds on an iPad – without any paper calculations or calls to air traffic control. Pilots can make direct instant requests to flight operations for final fuel plans.